Club Penguin Cheats by Mimo777 Club Penguin Cheats by Mimo777: The Chattabox Open! Another message from out Club Penguin friend Chatta! Last week's beach party was totally epic! We had such a good time and it was fun heading back to my iggy for the after party. Check out the photo to see if you can spot yourself. Hey, did you know the Australian Open tennis is on in Melbourne right now? It's so exciting! Tennis is one of my favourite sports. So how about we have a tennis party?! 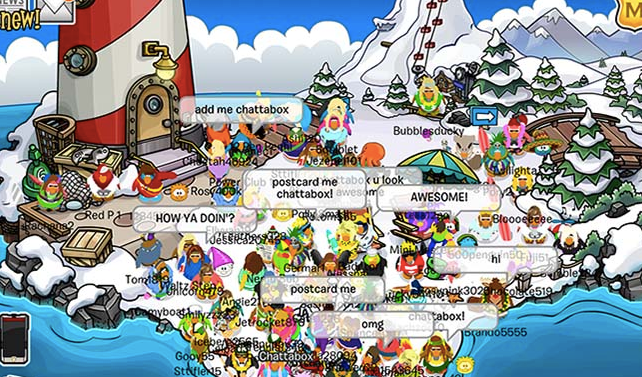 I am so seriously tired of Chattabox this and Chattabox that, why can't Polo Field, Spike Hike, or other better moderators visit instead. Heck, why can't mascots also come too so we can get a second chance to obtain a background we missed the first time. Its a lot better than having Chattabox appear every time.